It's hard to believe that I started my blog 2 years ago. What started as a way to work through my feelings after my divorce has grown into so much more in such a short time. Through this blog I have rediscovered and nurtured my love for writing, inspired others (so I'm told), connected with many wonderful people and been accepted into a great online community of bloggers. Given that my blog is having a birthday I figured it was fitting that we have an online party to celebrate. Unfortunately there wont be any cake, but there will be presents and I'm giving them to YOU! To say thankyou to you all for reading I have teamed up with some wonderful businesses and put together a MASSIVE anniversary giveaway. There are 27 prizes for 27 lucky winners. I have linked up with businesses that I think you will all love. 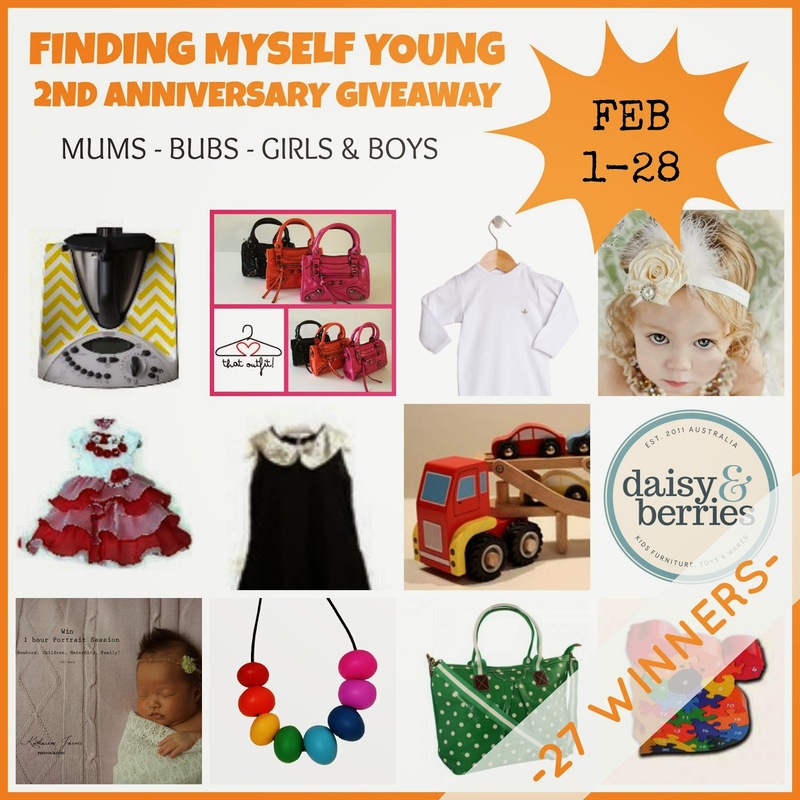 There are prizes for mums, babies, and kids (the only ones missing out are the dads - but you guys should enter to win something nice for your wives hint, hint). To win all you have to do is like some pages and answer a simple question. Easy! Suppori slings give mums (and dads) a light weight no tie easy alternative to traditional baby carriers. The triple woven mesh structure allows for air flow unlike a lot of other carriers. They are suitable for babies and toddlers 7kg to 15kg in weight. Babies weight is distributed across the hips and deltoid muscle reducing back pain. Suppori are offering one lucky reader a Suppori sling in the size and colour of their choice. Available in 31 different colours. Winner to specify size and colour required. 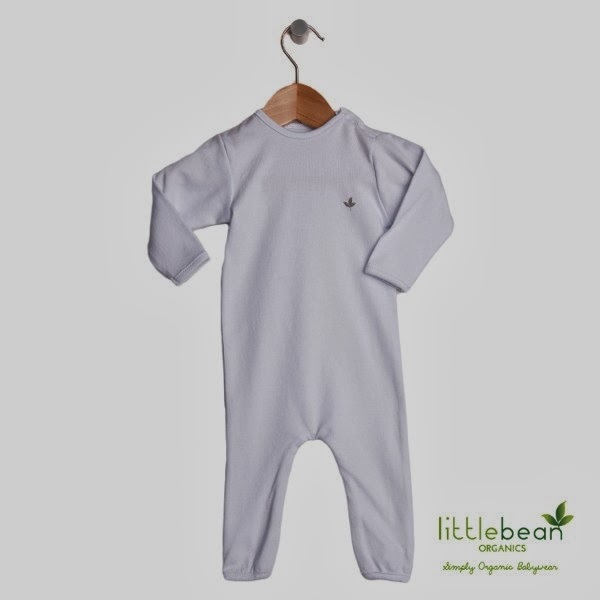 Little Bean Organics stock a range of affordable certified organic cotton baby clothes. They are generously offering one lucky reader the chance to win a white organic onesie. It is available in size 000, 00, 0 or 1. Winner to specify size required. Coolibah Kids stock a range of items for the children in your life including clothing, shoes and sunglasses. They have generously donated a poppy drops starter kit. Poppy drops are veggie dye temporary tattoo earrings for little ones who don't have pierced ears. Your child can still have all the fun of pierced ears, without the pain of piercing. Flip Flops is a children's shoe store in Mona Vale (in Sydney's northern beaches). They stock high quality superior fitting shoes for babies to 11yr olds. They have a huge range of shoes including school shoes, sandals, boots, mary janes, ballet flats, gum boots, sneakers and super cute converse all stars. 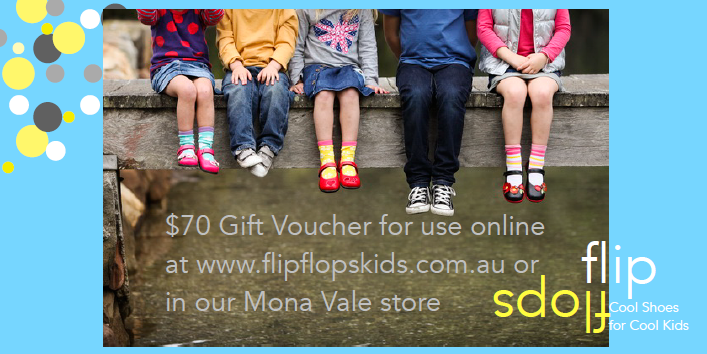 Flip Flops are giving one lucky reader a $70 voucher which can be used in their online shop or in-store at the Mona Vale shop. Beaches Kids stock an extensive range of durable wooden toys and furniture for children of all ages. They are giving one lucky reader the opportunity to win this cute koala number puzzle. The puzzle is hand made , painted with non toxic paint and is a fair trading item. 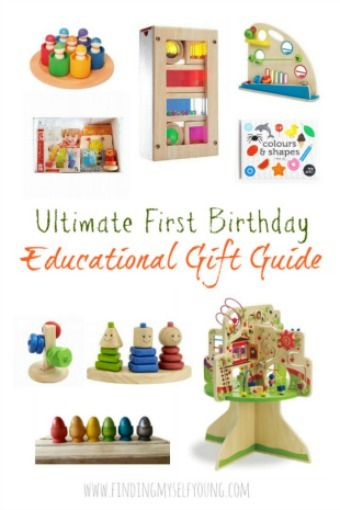 It is a great learning toy and the pieces are chunky so easy for little hands to grab. Luna Blu have all your handbag needs covered. They sell vintage inspired oil cloth bags, accessories and purses. Their range includes kids backpacks, beach bags, overnight bags, nappy bags and more. They are offering one lucky reader a Megan bag in the Green Spot print. The Megan bag can be used as an oversized handbag, overnight bag or nappy bag. I have this bag in the red spot print and use it as a nappy bag (and handbag combined) and I absolutely love it. Bean and Me sell a range of baby and children's products, including organic and ethically made clothing and toys. See more about their product range in my review here. Bean and Me have donated an Ergo AirCocoon baby swaddle for one lucky reader to win. The swaddle is made from organic bamboo and has no zips or velcro. It will keep your baby securely swaddled on hot or cold days and nights. It is highly breathable, eco-friendly and antibacterial. 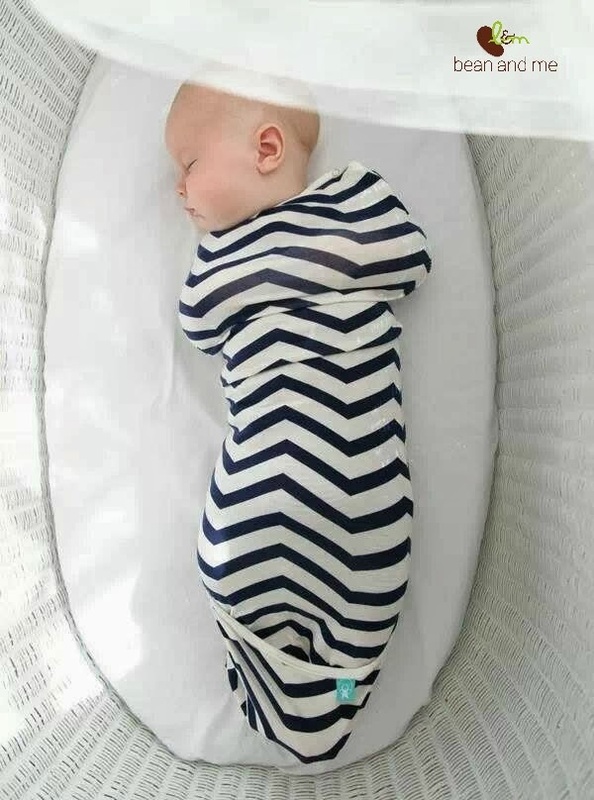 The swaddle is available in either navy or coral chevron in size 0-3 months or 2-6 months. Winner to specify colour and size required from those in stock at end of promo period. Little Treasure Designs sell a great range of affordable boys and girls clothing for the little treasures in your life. They stock cute outfits for babies and children. They have donated this cute boys safari inspired zebra outfit. Prize is available in size 1-2yrs, 2-3yrs, 3-4yrs or 4-5yrs. Winner to specify size required. 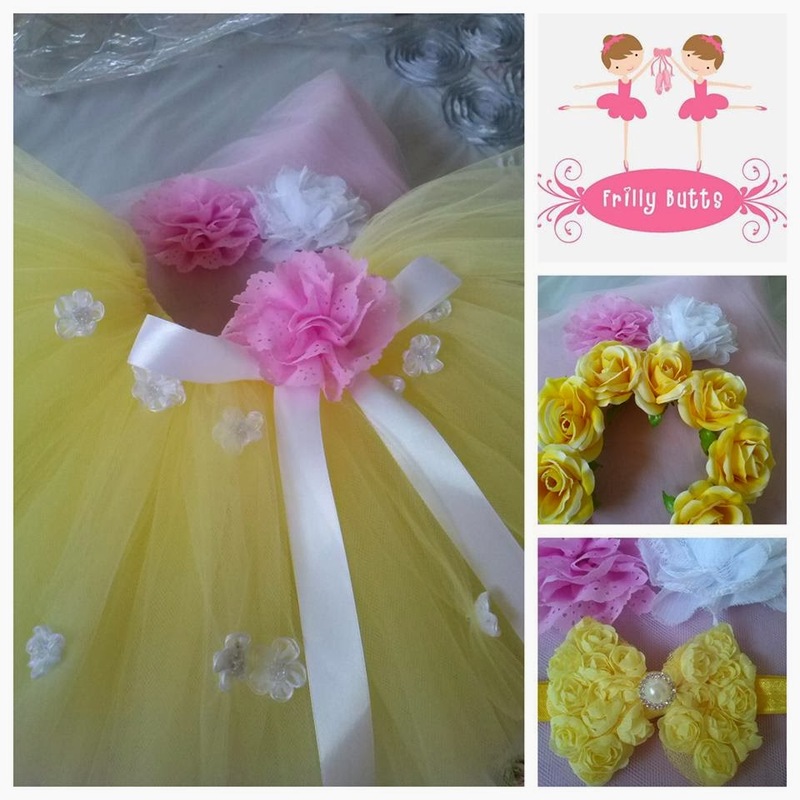 Frilly Butts specialise in custom made tutus, tutu skirts, dresses and flower girl dresses for mums and little princesses. They have generously provided a Limoncello tulle tutu embellished with white organza flowers and a detachable satin ribbon bow with pink lace flower (size 0-2yrs). It also comes with a yellow rosebud crown and yellow chiffon rose headband with a pearl centre. Prize is only available in size 0-2yrs. 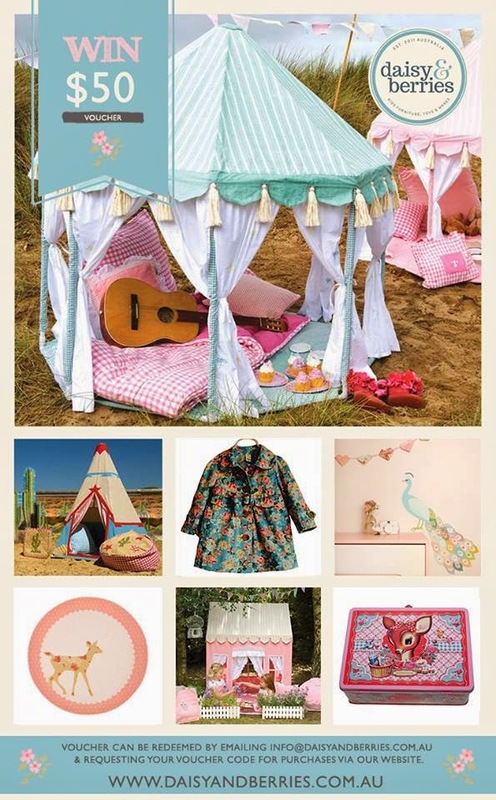 Daisy and Berries is a gorgeous online children's boutique that stock a huge range of children's items including furniture, playhouses, clothing, wall decals, bedding, bean bags, night lights, stationary and gifts. They specialise in themed playhouses and vintage inspired products. Daisy and Berries are offering one lucky reader a $50 voucher to use for online purchases. Voucher code needs to be entered at checkout in order to receive discount. 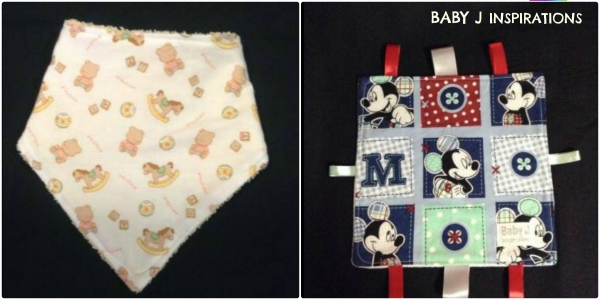 Baby J Inspirations sell a range of baby items including bandanna bibs, taggies, jewellery, buntings, bags and headbands. All of the items stocked are handmade by owner Danielle. She has provided 2 prizes for 2 lucky winners. 1 x Rocking horse bandanna bib and 1 x Mickey Mouse taggie. 1 prize for each winner. Kate Inglish Designs sell personalised clothing and gifts for babies and children as well as craft turntables, mini suitcase sets and wooden toys. They have generously provided a wooden car carrier truck for one lucky reader. The truck also comes with four wooden cars (as shown). The truck features an expandable tray which comes down to allow the cars to drive up into position. It's painted with acid free paint. It is approximately 28cm long x 9cm wide x 11cm high. Each car is 7cm long. Suitable for 18 months +. 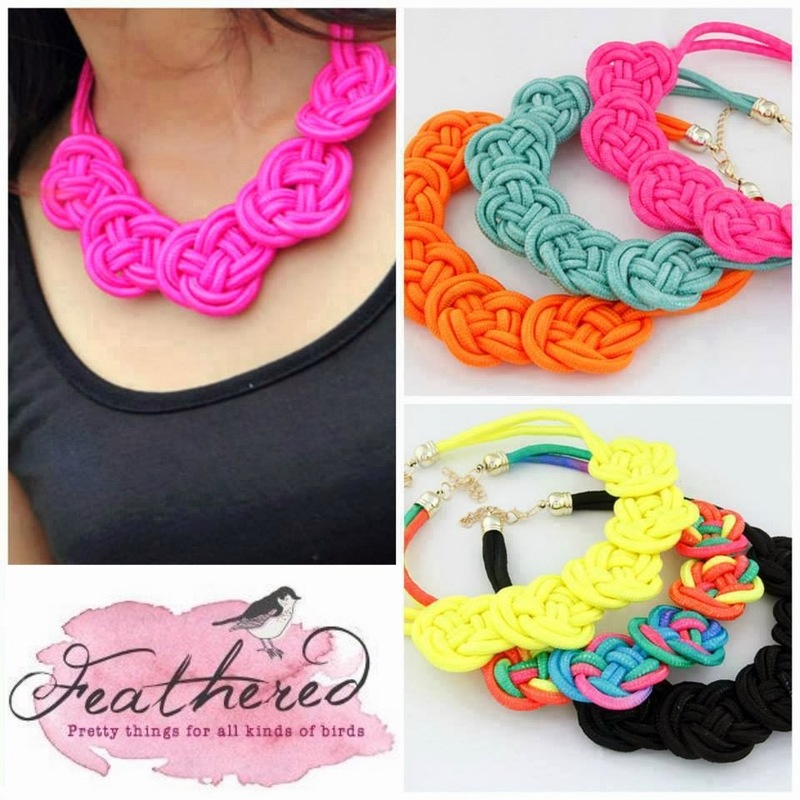 Feathered sell a range of gorgeous accessories that are stylish and on trend for affordable prices. They have a rope necklace up for grabs for one lucky reader. Available in colours shown above. Winner to specify colour required. Katharine Jarvie Photography is run by my childhood friend Katharine Jarvie. 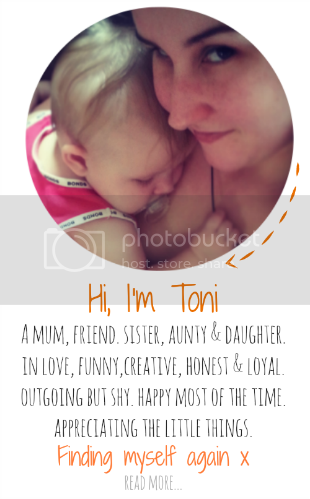 She specialises in maternity, newborn, children and family shoots. She is particularly good at capturing candid moments, even her 'posed' photos have a relaxed and emotional feel to them. I have used her for my maternity shoot and bubba's newborn shoot and highly recommend her. She is kindly offering one lucky reader the chance to win a 1 hour portrait session (RRP $200). 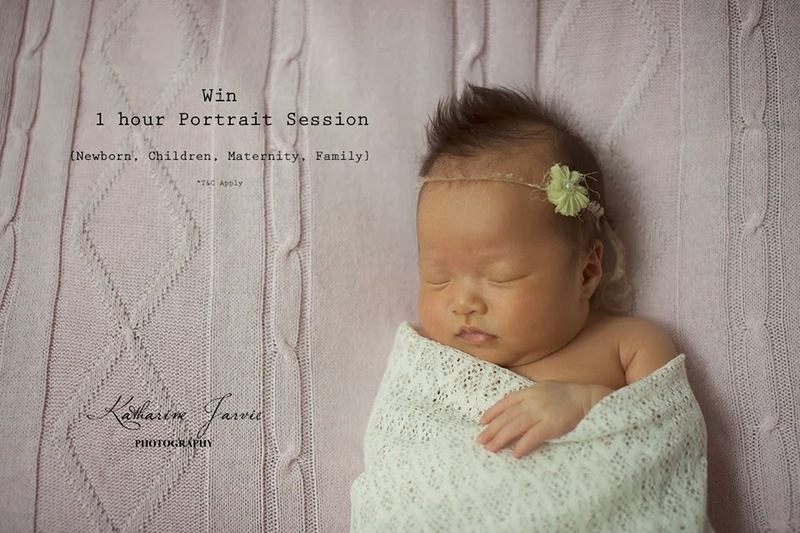 Winner can choose between a newborn, maternity, individual or family shoot. Winner must be willing to travel to North Brisbane for the photoshoot. Winner can choose a location of choice on Brisbane's northside or one of Katharine's previous locations. Prints will be available for purchase from an online gallery. Voucher is valid for 2 months from date of issue. Love that outfit stock a huge range of styled outfits featuring Australian and overseas brands, mainly for children aged 2-7. They are offering one lucky reader the chance to win a Mini B handbag for their little girl. How cute are these? I want one myself! The Mini B bag takes inspiration from the motorcycle bag by Balenciaga. It features quality hardware and soft cotton lining as well as an additional shoulder strap. Size is approx 20cm wide and 14cm high. It is available in black, orange or pink. Winner can pick colour of their choice. House of Jadore is a one stop shop for your wedding. They sell bridal gowns, bridesmaids gowns, flower girl dresses and mother of the bride/groom outfits. They also stock racewear, cocktail dresses, formal wear and accessories. If you can't find exactly what you are after they also do custom made wedding gowns. They have generously provided a girls formal dress for one lucky reader. Dress is available in size 0, 2, 3 or 4. Winner to specify size required from available options. 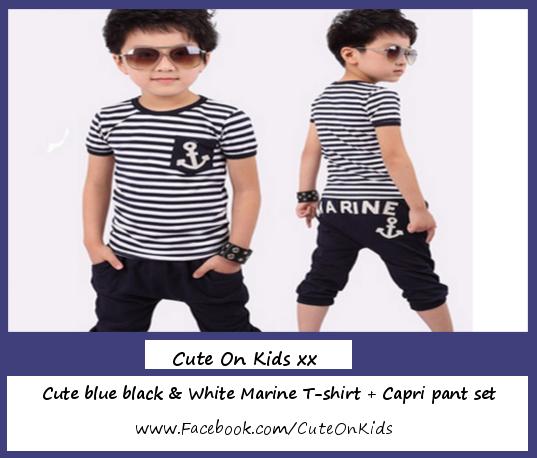 Cute on Kids offers a range of cute, elegant and stylish clothing and accessories for girls and boys at affordable prices. They have donated a black and white boys marine t-shirt and capri set. It is available in size 4 or 6. Winner to specify size required from available options. Harper and Hudson sell a range of silicone teething jewellery perfect for mums with teething bubs. The jewellery is non-toxic, BPA, PVC and lead free so is safe for little one's mouths. It's soft on babies gums and has no detachable parts. They have generously offered one reader a teething necklace of their choice. Winner to choose style and colour. Jean & Sebastian's Collection sell a range of practical and fun children's clothing, accessories and shoes. They have provided a $30 gift voucher for one lucky reader. Voucher expires 31st July 2014. Sahara Fleur is a women's fashion label with a boho-eclectic character, breathing fresh life into everyday fashion. Owners Lisa and Olivia listen to what their consumers want and respond on trend. There is a strong marriage between their loungewear and outerwear collections. They have generously offered a $75 gift voucher for one lucky reader. Voucher to be redeemed online. Nibbly Bits offer mums a modern solution to an age old teething problem. They stock a range of practical, fashionable "mummy chic" silicone teething necklaces, pendants and bracelets. You can mix and match their necklaces and bracelets to create your own fashionable mummy look. All products are BPA, Phthalates and PVC free. They comply with SGS Safety Standards and are FDA approved. I have heaps of their products and bubba loves them. They are offering one lucky reader the chance to win an abacus necklace in the colour of their choice. Winner to specify colour required. Little Miss Fish is an online children's boutique specialising in little girls clothes, party dresses, flower girl dresses and accessories. They have donated a feather and pearl headband for one lucky reader. 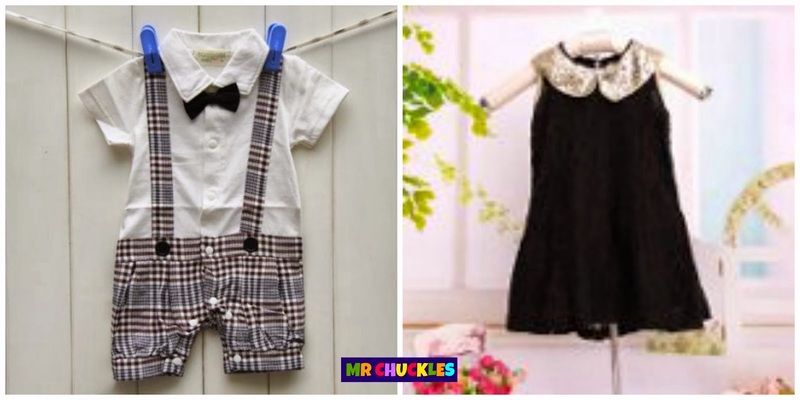 Mr Chuckles sell top quality baby and children's clothing, shoes and accessories. They have generously donated two prizes for two lucky readers. A boys romper, suspender and bow tie outfit and a girls black lace dress. The boys outfit is available in size 00, 0 or 1. 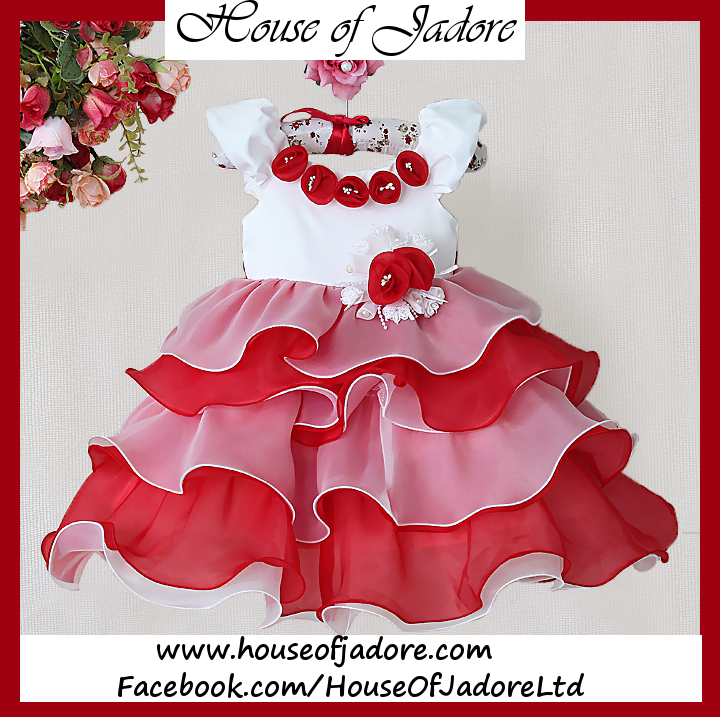 The dress is available in sizes 1-6yrs. 1 prize per winner. Winners to specify size required from sizes available. Magic Valley La Stella is a little girls clothing store selling all handmade items. They also offer custom orders. They make tops, singlets, dresses, ruffle butts and headbands. 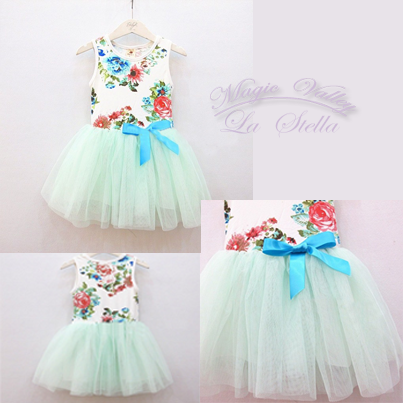 They have generously donated a floral and tulle girls dress. Dress is only available in size 3. Winner to pay postage of $7. 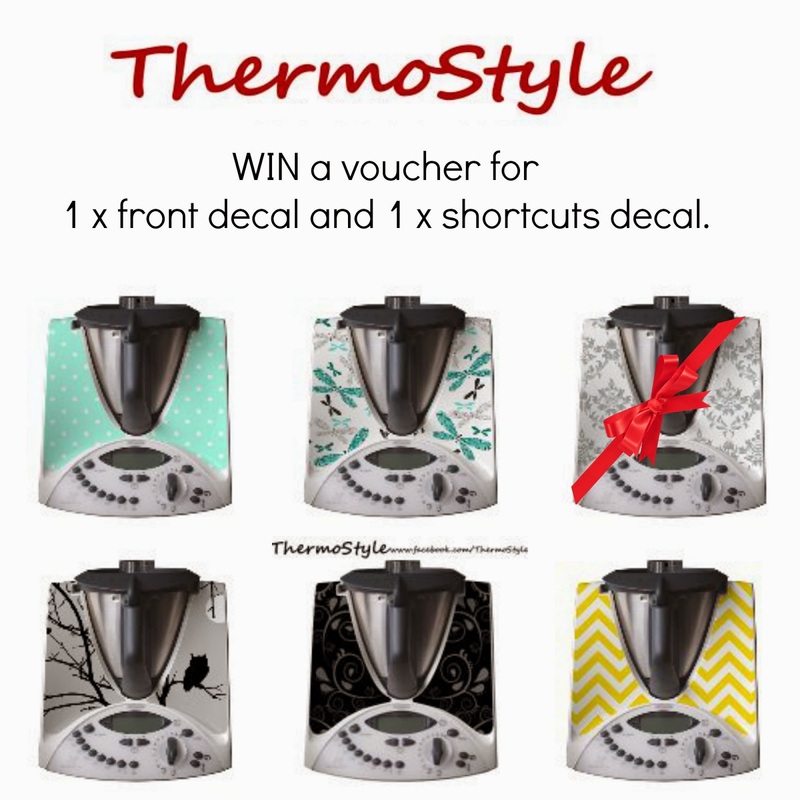 Thermostyle sell Australian made removable vinyl stickers to add some style to your Thermomix*. They are offering one lucky reader the chance to win a voucher for 1 front decal and 1 shortcuts side decal (to the value of $37.95). The front decals are available in a range of prints as shown above (and others as shown on the website). Shortcuts decals can be used to list the ingredients, weights, time, temperature and speed for everyday recipes so you have all your recipes for your everyday favourites conveniently located in one place. *You must already have a Thermomix to use this prize. Winner to choose print for front decal. Voucher is valid for three months. So, do you like? All you have to do to win is follow the Rafflecopter prompts below and leave a blog post comment letting me know in 50 words or less which prize you would most like to win and why? *You can choose the name/url option to comment if you don't have any of the optional accounts, just remember to change it from anonymous to your name and include your email address so I will know its your entry. Competition is open to Australian residents only, excluding ACT. All Facebook pages must be liked in order to constitute a valid entry. Please ensure you read all the individual terms and conditions for each individual prize (written under photos) before choosing a prize. This competition is a game of skill and will be judged as such. All winners will be chosen by the respective businesses involved. Winners must make contact within 48hrs or prizes will be redrawn. Prizes will be distributed directly from the relevant business. Finding Myself Young takes no responsibility for the delivery of prizes. This competition is in no way associated with, administered or endorsed by Facebook. I would absolutely LOVE to win a Ergo AirCocoon baby swaddle for my Grand-bubba Isla... she keeps moving around and hitting herself, and then is wide awake! Any prize would be great but photoshoot or the children's clothing would be amazing. I love updating the family photos whenever I can to see how much my children have grown. Any prize would be a great suprise but the suppori sling would be perfect of for our baby with its gender still in diguise. I Would love to win the Kate Inglish truck trailer with the cars because I love the fact it's made from wood and acid free paint. My 2 year old son is obsessed by cars and trucks and loves technical things. I could see him spending hours unfolding the tray and running the cars out and then folding it up again. Congrats on 2 years! I myself love them all. I've had my eye on a unicorn cushion you see. She has great taste like me but I'm not one to brag. Either the suppori sling of the Katherine Javie Photography package would be good please but all prizes look awesome. I would love to win the $75 voucher from Sahara Fleur. I forgot why ......... I love the comfortable, easy to wear styles & choice of fabrics for their designs. Mr Chuckles Black Lace Dress is gorgeous. Every girl needs a little black dress in their wardrobe! i would love to win the photo shoot as it would be great for my daughter to have a really good photo of all three granddaughters together! Would look cute out on the town! Congrats on your two year anniversary, Toni! What an amazing achievement. And holy wow! You have some awesome giveaways going on here! And I’d stand out from the crowd with this cool Designer touch! I would love any of these great prizes. I'm sure both of my sons would love the wooden car carrier truck! I'd love to win girls formal dress for my girl. It's so gorgeous. I'm going to be completely honest and say that the kid’s prizes are gorgeous but I think it's about time I updated my wardrobe! I honestly cannot remember the last time I bought some nice clothes and my son is 2, I would pick the Sahara Fleur prize! I love bright colours! My wardrobe is like a roller coaster of sizes, big and small. Now I am going down, I would love a $75 Sahara Fleur voucher to spend on some clothes to match my size, give me a unique style and compliment my new look. I would love to win the koala number puzzle! My 18 month old absolutely adores puzzles and I always have to sing to 10 over and over again while changing her nappy to get her to lay still for a couple of minutes! Both of her favourite things in one! I would most like to win the wooden car carrier truck because my son loves trucks and wooden toys so what more could i ask for, its a truck and its wooden, it would make his day!! I would love the handbag! I've just had to put some duct tape on the one I have now to keep it together! I would truly love to win the Girl's Formal Dress from House of Jadore. The dress is absolutely stunning and perfect for my daughter to attend my brother's wedding this year. I would love to win the $75 Sahara Fleur Voucher....I need some new clothes. How can I possibly choose from all these BRILLIANT prizes? I'd love to win any of these surprises. Because they have lots of items I want to buy for my babies. 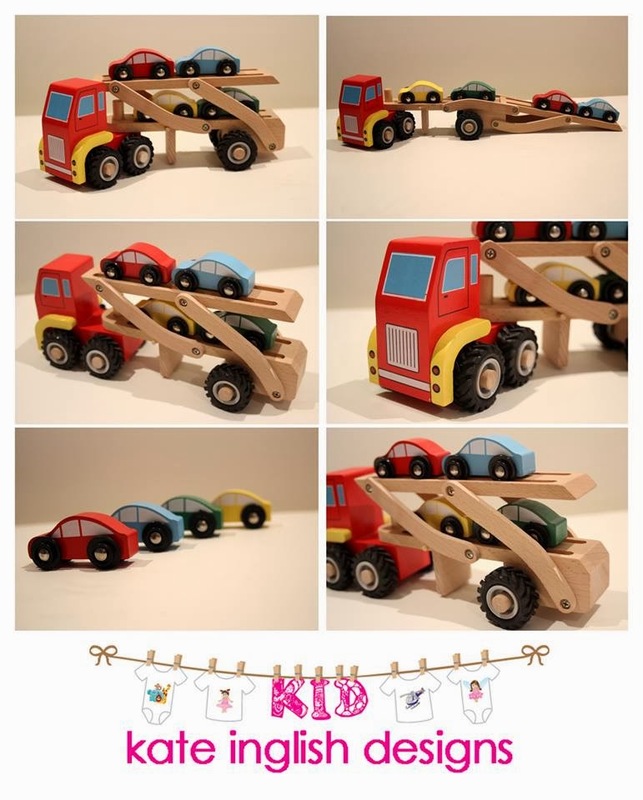 My little man would absolutely adore the Wooden Car Carrier Truck from Kate Inglish! Wow! Any of these would be wonderful... they are all awesome prizes. Thanks for hosting this massive giveaway and happy 2 year anniversary! all amazing prizes! i would love the Suppori Sling or Air CoCoon Swaddle as have heard/read great reviews on both & would love to try them out. with princess no 2 due in 2 weeks the Suppori Sling would make chasing after miss 2 easier especially out & about. I had trouble keeping Izabell wrapped when she was a baby so the swaddle would be a relief for our new arrival. I absolutely adore the wooden counting koala, it's so cute, and I know my girls would get hours of fun out of this for at least the next 5 years! thankyou to all the sponsers for such a great chance! But the Luna Blu Megan bag carries all the style to impress. Can not find my comment so doing it again. 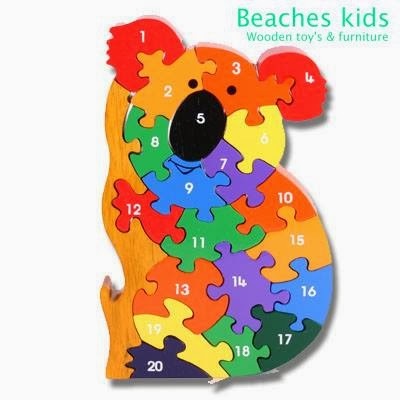 Would love the koala wooden puzzle as my children love counting and this would help them. What a great giveaway! I'd make good sue of the Daisy and Berry gift voucher, to redecorate my very toddler boys room into something a little more big boy! Wow what a fabulous giveaway. The wooden trucks take my fancy the most! Megan bag in the Green Spot print from Luna Blu as I just love bags! Winning the photoshoot would make my day! Would make the most fantastic prize! I love the Beaches Kids Koala number puzzle, such a great toy to keep the kids thinking & still have fun! I love to accessorize my dresses. So i would love to win the statement rope necklace.... its gorgeous!! My daughter would love the poppy drops starter kit from Coolibah Kids, she loves dressing up and looking at my earrings. She would love to be able to wear some like her Mummy. 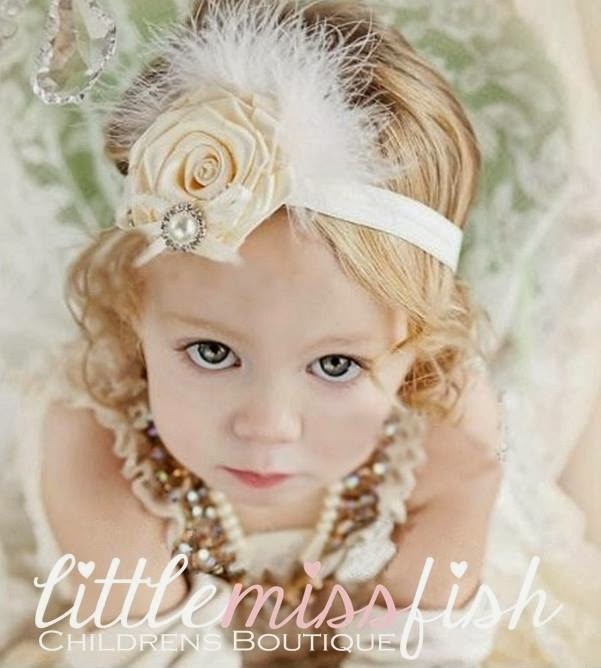 I would like to win all, but I love the Little Miss Fish Feather and Pearl Headband! I like the Luna Blu Megan spotted green bag. Great as a nappy/handbag. I would love the Megan bag, green is my favorite colour and I need a new bag. a wooden car carrier truck from Kate English Designs for my litte grandson would be a wonderful first car set to be exposed to, such quailty and a terrific design. I would simply love the gorgeous wooden truck for my 2 year old! he loves trucks at the moment and I know he would be super excited to play with this! The wooden car transporter truck. My son is fascinated with them and loves watching them load and unload cars at the car yard near Nannas. I would love to win any because when moving we lost heaps to thieves (including my kids clothes) so trying hard to replace everything while struggling financially. 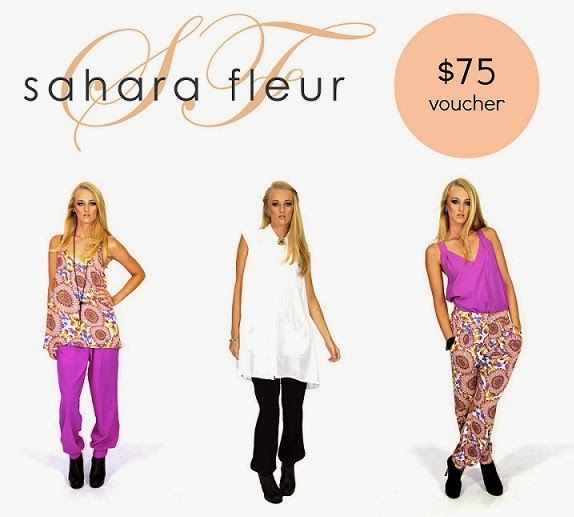 I would love to win the $75 voucher for Sahara Fleur. I sure could do with a new outfit and Sahara Fleur have amazing clothes!!!! All great prizes though and I would love to win any of them. Hi....oh my ...the truck carrying the cars! I'd love to win any of the baby stuff as we are expecting our first and haven't really bought anything yet. How can I choose?? Anything would be awesome but if I could choose mayne the ergo baby cocoon. Thanks! The cocoon would be awesome as my little man loves the one he has & its hard to get him out of it & wash it ready for his next sleep!! I would be extremely happy to win any of these amazing prizes! My first choice would be the Suppori sling. It looks so much quicker and easier to use than other slings. Also love the breathable mesh, perfect for these hot days!! So many beautiful and wonderful prizes , If I had to pick one the suppori babysling would be loved and well used , handy for swimming and keeping a hand free for our 2yr old. my little god daughter it would appease!! love the luna blu megan bag its my birthday this month and as a struggling single mum I get nothing ever, love to finally have a present for me, even though I know my girls will try and steal it :P love to be rewarded for my daily hard work for once! The Poppy Drops starter kit. My daughter wants to wear earrings like Mummy, Daddy won't let her get her ears pierced. She'd love these so much. She loves dressing up. Happy to see your doing great now.Gives me positive thought when feeling low.If I win would like to get the prize offered by frilly butts.Thank you for this awesome giveaway. Definitely the Kate Inglish Designs wooden car carrier truck. Our son is 8 weeks old now, but we know that he will absolutely love this timeless, classic toy. Hopefully he will be able to pass it on to his son. I think it would be really flash if I could win that pink handbag. It would be the greatest prize in the world and it would make me really, really happy! Dad said to cross my fingers and I’ll win it so I’m doing that now! That's for the Love that Outfit Mini B Bag! A dress for my girl or romper for my boy infact anything for my kids would be really nice of you. Would love any Prize but I absolutely would love to win the Ergo AirCocoon Baby Swaddle for my baby girl due in April I especially love that it is made from organic bamboo and breathable keeping my Baby as comfortable as possible whilst sleeping. Great for everyday and even for tots. The Megan bag is not at all bland. It suits me like a hand to a glove! Thanks everyone for your entries, competition is now CLOSED. Thank you for this awesome competition and giveaway. Great comp! Do you still hole them anymore? Would be very interested to be involved! What a cute lovely baby. I love him very much.